Your course includes 9 dives on some of the best dive sites the Outer Great Barrier Reef has to offer as well as plenty of time to snorkel, relax and really enjoy the reef experience. All this makes this course unmatched for experience and value. Your 5 Day PADI Learn to Dive Course is broken down into two components - 2 Days of classroom and pool and training and then a 3 day, 2 night liveaboard trip to some of the best Outer Reef dive sites available. The next 3 days and 2 nights are spent living on board one of our premium live aboard dive vessels. You'll have the opportunity to participate in 9 dives on a variety of our 16 exclusive dive sites on the outer Great Barrier Reef. Your first 4 dives will complete your open water certification and then as certified diver you are able to undertake up to 5 more recreational or pleasure dives. One of these dives is a guided night dive! 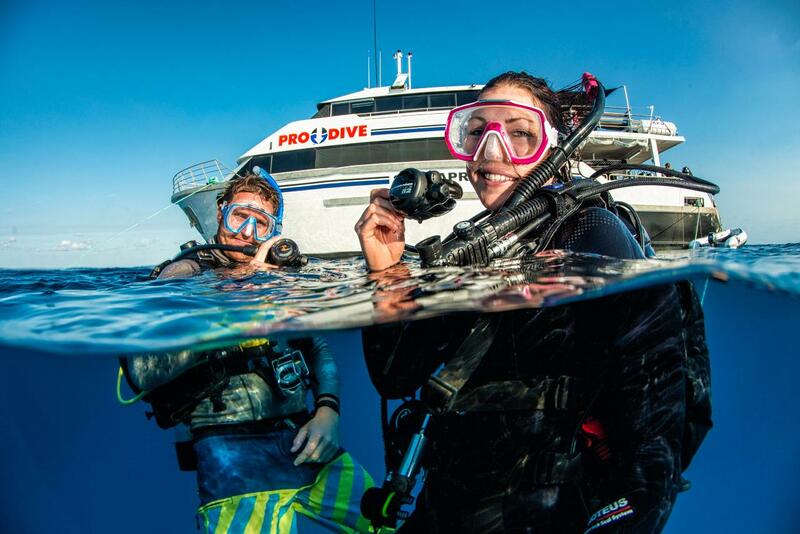 These extra dives will be a highlight of your course and a truly memorable experience. On the night of your return to Cairns you have the option to join your fellow passengers and the crew for a farewell dinner at a local restaurant. 6:00pm - Dinner - the menu changes each trip however it will be wholesome, hot and of course lots of it! Then - time to relax! 6:00pm - Dinner - again, the menu changes each trip however it will be wholesome, hot and of course lots of it! 7:00pm - A guided night dive after dinner - another great experience! Important Information For Learn to Dive Course Participants: Prior to commencing your Learn to Dive Course you are required to complete the self-assessment Entry Level Student Dive Medical Declaration. A positive response to any question means that there is a pre-existing condition that may affect your safety while diving and you must consult a medical practitioner preferably with experience in diving medicine to obtain a dive medical certificate that states that you are fit to undertake recreational diver training. Taxes and Charges: An additional fee of $70.00 person is payable direct to Pro Dive Cairns. This charge includes an $19.50 Government Environmental Management Charge as well as a Port Departure Tax and administration costs. Camera Hire: Digital underwater cameras are available for hire on board our dive boats for a cost of A$40per dive. Please note you will not be able to use the underwater camera until you are a certified diver.